Vigna unguiculata is a leguminous crop plant belonging to the same genus as bambara groundnut. It was first domesticated in West Africa 5,000-6,000 years ago and today is grown commercially in over 33 countries. It is a hardy crop which thrives in sandy soils and is relatively tolerant of drought. It is considered the most important pulse crop in the savannahs of West and Central Africa where it is also cultivated as a vegetable and to feed livestock. Cowpea originated in Africa and today the greatest diversity of cowpea can be found in West Africa in the savanna regions of Burkino Faso, Ghana, Togo, Benin, Niger, Nigeria, and Cameroon. Cowpea was introduced to Europe, probably around 300 BC and to India 200 BC. 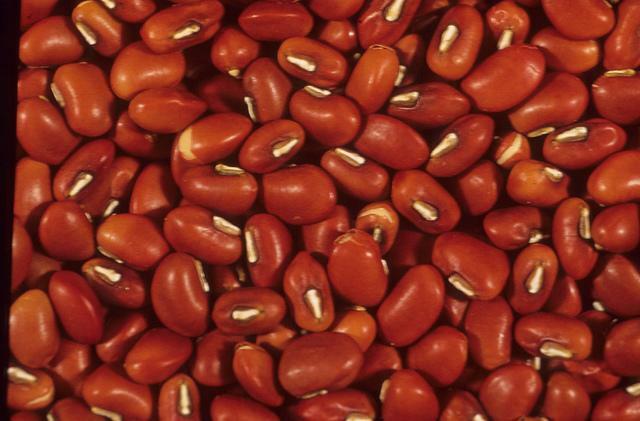 The Spanish introduced cowpea to tropical America in the 17th century and the crop is grown widely in the United States, the Caribbean region and Brazil. Overview: Vigna unguiculata can be either an annual (completing its lifecycle in one year) or a perennial (living for several years) herb. Some types are erect and trailing and other are climbing herbs up to 4 metres long. The plant has a well-developed taproot with many lateral roots extending from it. 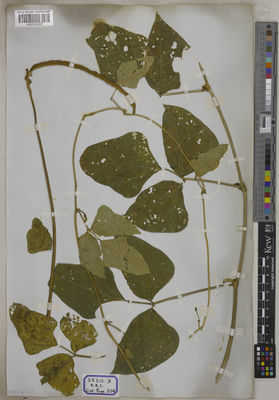 Leaves: Positioned alternately along the stem and composed of three leaflets. The petiole, the appendage which holds the leaf is up to 15 cm long, and in some cases 25 cm long, grooved above and swollen at the base. Flowers: The flowers which are pink to purple (sometimes white within the var. unguiculata cultivar group Melanophthalmus) are clustered towards the top of an unbranched axis (known as a raceme). 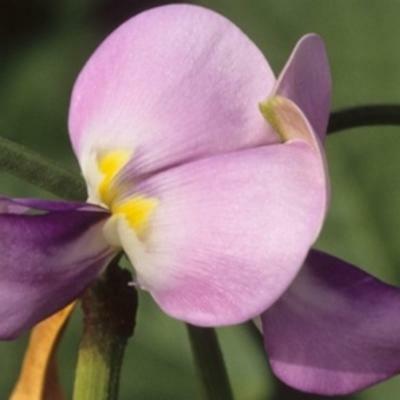 The flowers are papilionaceous, typical of species belonging to the subfamily Papilionoideae, and resemble, for example, the pea flower. Each flower has 10 stamens (male reproductive organs), nine of which are fused together and one free. The ovary (female reproductive organ) is 1.5 cm long. Fruit: A cylindrical seed pod 8-30 cm long (in some cases 120 cm long), is pale brown when ripe and bears 8-30 seeds. The seeds are oblong to globose (spherical) 0.5-1 cm long and can be black, brown, pink or white. The hilium (the scar left on the seed from its attachment point to the placenta) is oblong, covered with a white tissue with a blackish rim. Cowpea is a crop cultivated mainly for its seeds, which can be cooked and eaten alone or mixed in with other vegetables and spices to produce a nutritious bean soup. Cowpea is eaten in large parts of Africa and in many areas it is the preferred pulse. In West Africa, cowpea seeds are ground into flour and mixed with onions and spices to make cakes which are either deep dried ('akara balls') or steamed ('moin moin') for a delicious snack. Cowpea flour can also be processed into crackers and baby foods, as is the case in Senegal, Ghana and Benin. In the United States, green seeds are sometimes roasted like peanuts. Besides the seeds, the leaves and pods of cowpea are eaten as vegetables which can be served boiled or fried. Many people dry the leaves in the sun to preserve them so that they can be eaten during the dry season when food is scarce. The best leaves to use are those picked towards the end of the season, because these tend to grow under conditions of stress and are generally tastier. Cooked cowpea pods are more typical of Asian cuisine than African cuisine. In some parts of Africa, such as Ethiopia and Sudan, the roots are occasionally eaten. The high protein content of cowpea makes it an excellent fodder crop. Cowpea is cultivated for fodder in West Africa, Asia, and Australia; it is used for grazing or mixed in with dry cereals for animal feed. In Nigeria some varieties of cowpea are cultivated for their strong fibre which is used to make fishing gear as well as to produce good quality paper. In the United States cowpea is grown for green manure. The dry seeds also make a good alternative to coffee. Various parts of the cowpea are used medicinally. The leaves and seeds are applied to skin infections as a poultice, the leaves are chewed to relieve toothache and powdered carbonized seeds are applied to insect stings. The roots are used as treatment for epilepsy, chest pain, constipation and as an antidote to snakebites. Its ability to fix nitrogen from the air makes cowpea a good fertiliser for the soil. In rice farming, farmers grow cowpea either before or after the rice crop, as this is found to increase the food production from the land area. In folklore, cowpea is used in sacrifices by the Hausa and Yoruba tribes to drive away evil and to pacify the spirits of sickly children. The Millennium Seed Bank and the Global Crop Diversity Trust are engaged in a ten-year project, called 'Adapting Agriculture to Climate Change'. The project aims to protect, collect and prepare the wild relatives of 29 key food crops, including cowpea, so that they are available to pre-breeders for the development of new varieties that are more resilient to the effects of climate change. The Millennium Seed Bank Partnership aims to save plants worldwide, focusing on those plants which are under threat and those which are of most use in the future. Once seeds have been collected they are dried, packaged and stored at -20°C in our seed bank vault. 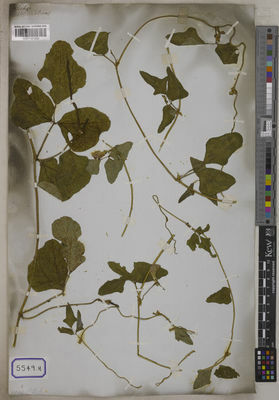 Pressed and dried specimens of cowpea are held in Kew's Herbarium, where they are available to researchers by appointment. Details and images of some of these specimens can be seen online in Kew's Herbarium Catalogue. Wild types grow well in savannah vegetation, in disturbed localities or as a weed at up to 1,500m altitude. 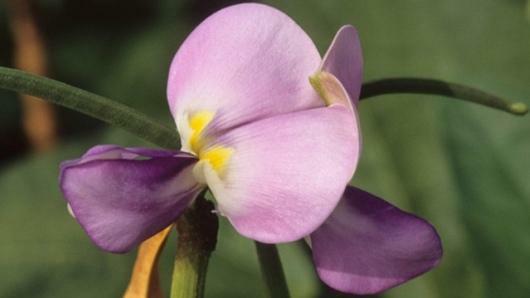 It can also be found in sandy areas, coastlines, woodland, forest edges or swampy areas. Annual or perennial erect trailing or climbing herb, 0.5–3 m long. Stem striate, glabrous, scabrous, pubescent or hairy. Leaflets 3, 1.5–16.5 × 1–12.5 cm, ovate, rhombic or lanceolate to linear, the laterals oblique, all entire or terminal leaflets subhastate to deeply 3-lobed at the base and laterals lobed on the outer margin, shortly acuminate or subacute and mucronulate, acute to rounded at the base, glabrous to pubescent on both surfaces; petiole 1.5–13 cm long; rhachis 0.6–2.5 cm long; stipules submedifixed, constricted at the point of attachment, multinerved, upper part lanceolate, 6–20 mm long, spur narrower, 2–6 mm long. Flower pink to purple, rarely white (mainly within var. unguiculata cultivar-group Melanophthalmus), 15–33 mm long; pedicel 1–3 mm long, not expanding as the pod matures; bracteoles 3–6 mm long, spathulate or lanceolate, 1–3-nerved. Calyx glabrous or pubescent; tube 2–5.5 mm long; lobes subequal, ciliolate, the upper pair joined for about half their length to form a broad lobe bifid at the apex or only at the base. Standard with 2 parallel widely spaced appendages. Pod 8–10 × 2.5–5 mm (except within cultivated races), linear-cylindrical, glabrous, scabrous, or pubescent. Seed 4–6.5 × 2–4.5 mm (except within cultivated races); hilum one third to half the longest dimension, excentric; rim aril slightly developed. Cultivada en Colombia; Alt. 70 - 1000 m.; Llanura del Caribe, Orinoquia, Valle del Cauca. Flowers white and mauve-tinged or pink or yellow. Annual or perennial erect trailing or climbing herb, 1–3 m. long. Stems striate, glabrous or slightly hairy particularly near the petiole-bases, sometimes with minute stiff hook-like hairs. Leaflets 3, ovate, rhomboid or lanceolate, the laterals oblique, 1·5–16·5 cm. long, 1–12·5 cm. wide, all entire or terminal leaflets subhastate to 3-lobed at the base and laterals lobed on the outer margin, shortly acuminate or subacute and mucronulate, acute to rounded at the base, glabrous or sparsely pubescent on both surfaces; petioles 1·5–13 cm. long; rhachis 0·6–2·5 cm. long; petiolules 2–5 mm. long; stipules submedifixed, constricted at the point of attachment, upper part lanceolate, 0·6–2 cm. long, spur narrower, 2–6 mm. long. Inflorescences axillary, few-several-flowered; rhachis 0·5–4(–5) cm. long; peduncle 2–36 cm. long, usually minutely uncinulate pubescent towards the apex; pedicels 1–2(–4) mm. long; bracts deciduous, lanceolate, 3–5 mm. long; bracteoles ± persistent, spathulate, 3–5 mm. long. Calyx glabrous; tube 3–5·5 mm. long; lobes triangular-lanceolate, 2·5–14 mm. long, acuminate, ciliolate; upper pair joined for about half their length or only at the base. Standard white, greenish, yellow or lilac-purple, paler outside, round, 1·2–3·3 cm. long, 1–3·2(–4) cm. wide, rounded or emarginate, glabrous; wings blue to purple; keel usually white or pale, not twisted. Pods erect or eventually hanging in cultivated forms, linear-cylindrical, 5·5–10(–90 in some cultivated races) cm. long, 3–11 mm. wide, glabrous or minutely verruculose. 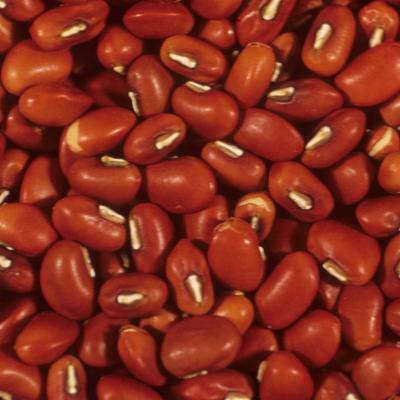 Seeds white to dark red or black, often mottled with black or brown, oblong or reniform, longest dimension 3·5–5(–12) mm., shorter dimension 2–3·5(–6·5) mm., 2·2(–4·5) mm. thick; hilum one-third to half the longest dimension, eccentric; rim-aril slightly developed. Vigna unguiculata subsp. cylindrica (L.) Verdc. Food, fodder, medicine, paper making, fishing material. Vigna unguiculata subsp. catjang (Burm.f.) Chiov. de la Estrella, M., Cabezas, F.J., Aedo, C. & Velayos, M. (2010). 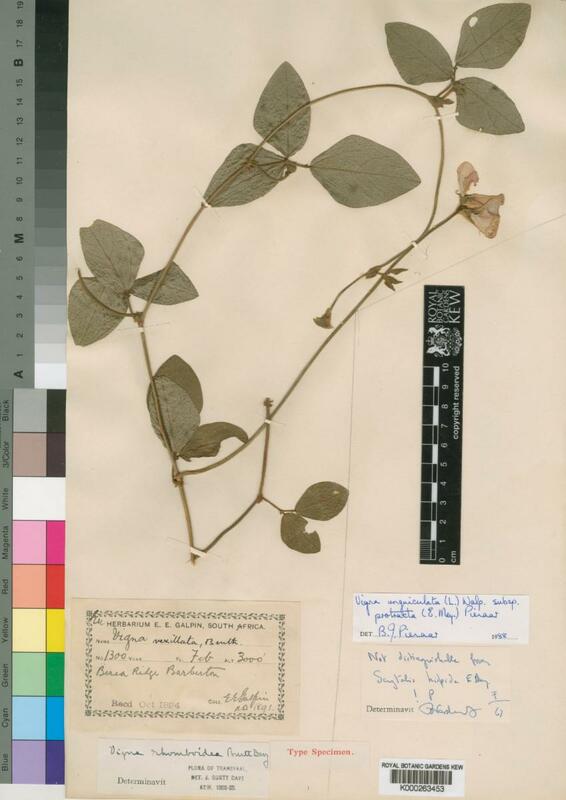 The Papilionoideae (Leguminosae) of Equatorial Guinea (Annobón, Bioko and Río Muni) Folia Geobotanica 45: 1-57. Beentje, H. (2010). The Kew Plant Glossary: an Illustrated Dictionary of Plant Terms. Royal Botanic Gardens, Kew. Mabberley, D.J. (2008). Mabberley’s Plant-book: a Portable Dictionary of Plants, their Classification and Uses. Third edition. Cambridge University Press, Cambridge. Royal Botanic Gardens, Kew (2008). Seed Information Database (SID). Version 7.1. Brink, M. & Belay, G. (2006). Cereals and Pulses: Volume 1 of Plant Resources of Tropical Africa. PROTA. Royal Botanic Gardens, Kew (2001). Flora Zambesiaca volume:3 part:5 Leguminosae by B. Mackinder, R. Pasquet, R. Polhill and B. Verdcourt. Duke, J. A. (1981). Handbook of Legumes of World Economic Importance. New York: Plenum Press. Wilczek in Fl. Congo Belge 6: 387, t. 30. Verdc. in Kew Bulletin 24: 542 (1970). Purseglove, Tropical Crops 1: 321 (1968). 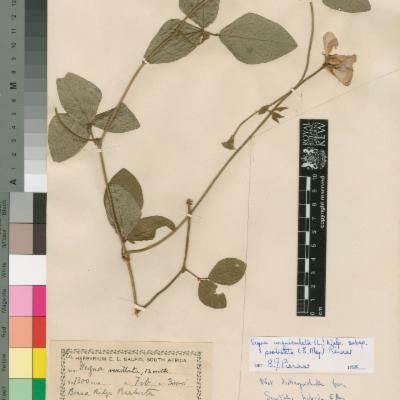 Hepper in Flora of West Tropical Africa, ed. 2, 1: 569 (1958). Wilczek in Flore du Congo Belge et du Ruanda-Urundi, 6: 387, t. 30 (1954). R. O. Williams, Useful and Ornamental Plants in Zanzibar and Pemba p. 483 (1949). Piper, U.S. Dep. Agric. Bur. Pl. Ind. Circ. 124: 29 (1913). Walp., Rep. 1: 779 (1842).